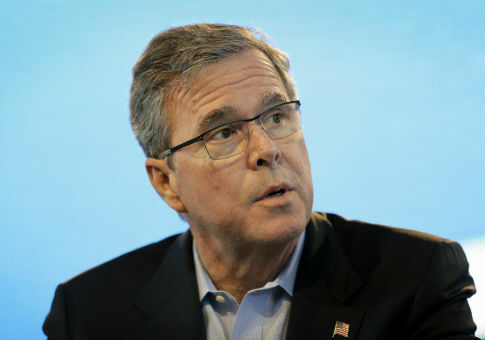 Jeb Bush said he would not make the same mistakes as Mitt Romney during a private event in New York on Thursday, saying the 2012 Republican nominee was unable to connect with voters in a genuine way. "[Romney] made it about a referendum on the president’s policies rather than about himself. He didn’t show his heart," said the former governor of Florida. "He didn't send a signal that he cared about people, when he did." The potential 2016 candidate made the remarks during a private question-and-answer session with high school students at the Ramaz School, where he was marking the celebration of Yom Ha’atzmaut, Israel’s Independence Day. "A lot of it is just connecting on a human level with people, not being behind some protective shield," said Bush. "Campaigning in a way where you’re outside your own comfort zone. Taking questions, not having it all scripted out, not having it all part of some narrative that producers made. Be more spontaneous." Bush also sought to distinguish himself from his potential Republican competitors, saying he would not compromise his values in order to win a primary campaign. "I know how to win a primary, I think. But the easy way to win a primary is the hard way to win a general. So you have to be true yourself," he said. He added that if he has "views that are a little unorthodox in my own party, I'm going to express them. I’m going to try to persuade people and have the courage in my convictions to persuade people." Some of these unorthodox views could include Bush’s support for elements of Common Core and immigration reform, which have drawn criticism from segments of the Republican Party. While Bush said he was "for higher standards," such as the ones required by Common Core, he believed "they shouldn’t be imposed from Washington." On immigration, he said he backs "earned legalized status." "You would come out from the shadows, you would have a provisional work permit, you would pay taxes," said Bush. He said increasing border security is critical, but it would not resolve the issue of the many illegal immigrants who are in the United States because they overstayed their visas. Bush said earlier this year that he was exploring a presidential run and is expected to make an official announcement in the coming months. He evaded one question from a student about whether he will run, saying only that he is "seriously considering it." When asked what impact his "name recognition" could have on the presidential race, Bush said he will not "just assume I’m well known because my name is Bush, and therefore it’s going to be easy." "It’s first of all a blessing to be the son of George and Barbara Bush. I’m totally blessed … I wish all children had the same kind of loving parents I had," he said. "If it’s just about Bush versus Clinton, or if I give some sense that I’m trying to break the tie between the Bush family and the Adams family for the number of presidents, it doesn’t work." "I have to show my heart," he said. "I have to talk about my life experience." This entry was posted in Politics and tagged 2016 Election, Jeb Bush, Mitt Romney, Republican Party. Bookmark the permalink.